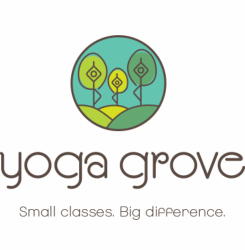 Located in Bloor West Village, Yoga Grove offers small classes for all ages and in a wide variety of styles, including Ashtanga, Flow, Vinyasa, Kids, Teen, 50+, Yin, Absolute Beginner and Restorative. Our classes are purposefully kept small so that everyone can have a richer, more personalized experience of yoga. Many people find themselves lost in a large studio class, unsure if they are doing the right thing as they try to follow the instructor, and unable to ask questions or get clarification throughout the class. With all class sizes limited to 6, students find that yoga is much more accessible, as the instructor is able to personalize the class to the needs, level and interests of the group, as well as to assist and interact with students throughout the classes. Whether you are a beginner or a seasoned yoga practitioner, our classes will enable you to strengthen your body, release tension and increase flexibility, as well as to relax your mind and come away with a sense of calm and equanimity that carries through to your everyday life. Here is a recent testimonial from one of our students, detailing beautifully how Yoga Grove is different from other studios - written to us in May 2018. Here is an excellent article on Yoga Grove, from spring 2017. And here are all kinds of reviews and testimonials we've received over the last 5 years. We are now offering our ever-popular Restorative Yoga with Massage classes multiple times a month. Enjoy the best of relaxation modalities blended together to offer the ultimate indulgence and deepest release. $75 Off Our Private Beginner Package! Save 10% on any of our Retreats! Refer a Friend and Get a Free Class! Help out at reception in exchange for yoga, retreats, merchandise and more! Subscribe to our ﻿﻿﻿﻿newsletter﻿﻿﻿ to keep up to date with our promotions, and be the first to hear about our events and schedule changes.